An archaeological evaluation was undertaken on land between Park Hall and Priory Street, Carmarthen in March and April 2001. Two trial trenches were excavated. A pit containing a Romano-British greyware vessel was recorded in one of the trenches. The vessel contained a cremation deposit and the rim from a small glass bottle. This burial pit, together with several other features, strongly suggested the presence of a Roman cemetery located between the Roman town of Moridunum to the west and the amphitheatre to the east. This particular cemetery would have been located on the north side of the main eastern approach road to the Roman town. The cremation deposit represents the first proven burial from Roman Carmarthen. 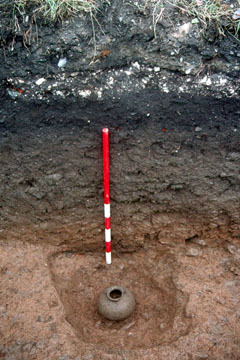 Several other linear features of possible late medieval or post-medieval date were also recorded in the trial trenches. Considerable deposits of post-medieval ploughsoil and modern overburden overlay the various features. These deposits were up to 1.3m deep. Project facilitated by Antur Cwm Taf / Tywi (the local Community Development Agency) and undertaken by Dyfed Archaeological Trust on behalf of the East Carmarthen Community Association. Financed by the European Union, ACTT and Carms CC Community Chest fund. The excavation of this historical site was essential for the submission of a planing application for a Community Resource Centre and public park. Thses have subsequebtly been approved. It is intended that the Roman and Medieval Heritage of the area be an integral part of this exciting community scheme.